The Woods Lake Loop is located in the Uncompahgre National Forest near Telluride, Colorado. 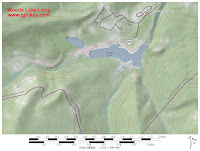 The loop is made by combining the Shoreline, Lone Cone Tie and Woods Lake Tie trails with a short section of the Woods Lake trail to create a route that travels completely around the lake. Along the way hikers are able to enjoy the scenic tranquility of Woods Lake and the forest of aspen and pine trees that surrounds it as well as distant views of mountain peaks that tower over 13,000 feet in elevation. To get to Woods Lake turn off of Highway 145 about 13 miles north of Telluride onto the Fall Creek Road. Follow the signs for the next 9 miles to Woods Lake. For this post we parked at the Woods Lake trailhead and followed the Woods Lake trail over the hill to the lake. Another good spot to start from would be to park at the Picnic Area. The loop begins near the half mile point of the Woods Lake trail as it approaches the lake. At present there isn't a sign designating the Shoreline trail but it is obvious nonetheless. The mountain peaks that provide the backdrop for the lake are over 13,000 feet in elevation. They are actually blocking the view of 3 peaks that are behind them that are above 14,000 feet. After the Shoreline trail works its way around the hill it passes through the picnic area and sets out across the dam. On the other end of the dam the trail crosses a footbridge where Fall Creek spills out of the lake. Right after crossing the bridge there is a spur trail that leads to the campground. From there the Shoreline trail continues toward the headwaters where Fall Creek runs into the lake. To continue on around the loop watch for a faint trail that branches off on the right and connects with the Lone Cone Tie trail. The Lone Cone Tie trail remains mostly level as it is following an old ditch. The trail passes close by a smaller lake that provides a summer home for a flock of geese. While camping in the Woods Lake Campground we would hear these geese in the mornings taking to the air and flying around the area for awhile before returning to the lake. It seemed to be part of their daily exercise routing. As the trail continues it begins entering a beautiful lush valley. 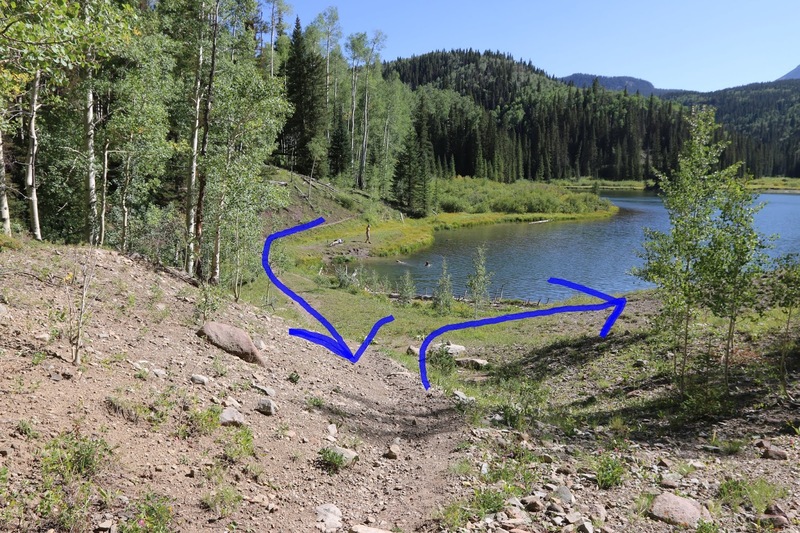 There is a sign at the spot where the Woods Lake Tie trail branches off on the left providing the return route for the loop. Woods Lake Tie is how the trail is labeled on the map at the trailhead. On the sign there is just an arrow pointing in the direction of the Woods Lake trail. That trail starts out by dropping down to the creek where it crosses and then spends the next mile traveling through a dark forest of pine and spruce trees. There are a couple of short climbs after the trail dips down and crosses two different branches of Muddy Creek. The Woods Lake Tie trail comes to an end at a 4-way intersection where it meets up with the Woods Lake trail and a spur that runs over to the Elk Creek trail. From the 4-way intersection is is only about a tenth of a mile on back to Woods Lake where the loop began and another half mile after that to the Woods Lake trailhead. 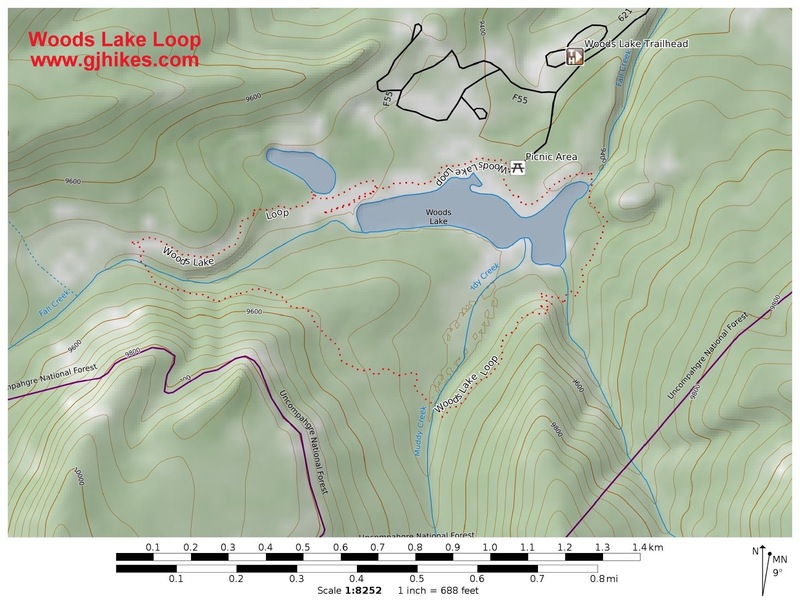 If you start at the Woods Lake trailhead the round trip distance ends up being 3.6 miles for the hike since you need to include the half mile to and from there to the lake. The campground at Woods Lake is very nice with restrooms, tables and firepits, and sites that can accomodate most any RV. There is supposed to be native Colorado River Cutthroat trout in the lake that you can fish for only with artificial flies and lures but we never did see any signs of them. If you do catch one you have to return it to the water immediately. We watched a couple of people that were swimming in the lake as well as some paddleboarders that all seemed to be enjoying their time there as much as those that were hiking. Whatever your plans are Woods Lake is a nice place to visit and one of our favorites. If you would like to see it for yourself then all you have to do is 'Take a hike'.